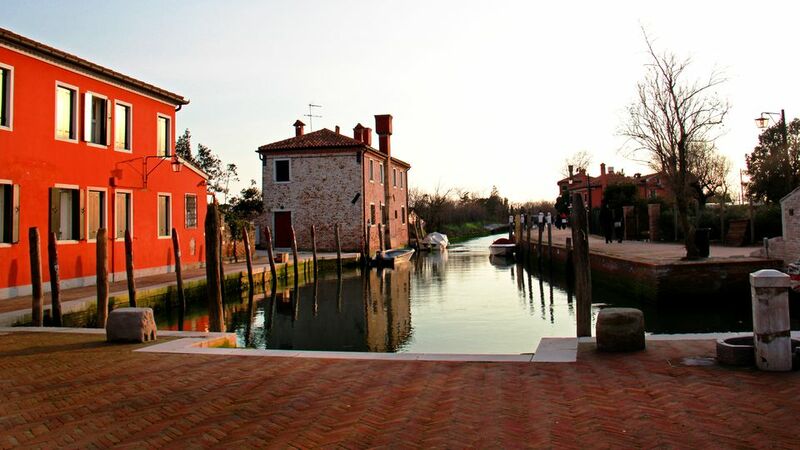 Torcello is one of the most popular islands to visit in the Venice lagoon yet it is still fairly peaceful. The main reason for visiting the island is to see the spectacular Byzantine mosaics in the seventh-century Cathedral of Santa Maria Dell'Assunta. Much of the island is a nature reserve, accessible only on the walking paths. Founded in the 5th century, Torcello is even older than Venice and was a very important island in ancient times, once having a population possibly around 20,000. Eventually, malaria hit the island and much of the population either died or left. Buildings were plundered for building material so that little remains of its once splendid palaces, churches, and monasteries. Torcello's cathedral was built in 639 and has a tall 11th-century bell tower that dominates the skyline. Inside the cathedral are stunning Byzantine mosaics from the 11th to the 13th centuries. One of the most impressive is the depiction of the Last Judgement. From the boat stop, the main path leads to the cathedral, less than a 10-minute walk. The cathedral is open daily from 10:00 to 17:30. There is an additional charge to climb up the bell tower. Next to the cathedral is the 11th century Church of Santa Fosca (free entrance) surrounded by a 5-sided portico in the form of a Greek cross. Across from the cathedral is the small Torcello Museum (closed on Mondays) housed in 14th-century mansions that were once the seat of the government. It houses medieval artifacts, mostly from the island, and archaeological finds from the Paleolithic to the Roman period found in the area of Venice. In the courtyard is the large stone throne known as Attila's Throne. The Casa Museo Andrich is an artist house and museum displaying more than 1000 artworks. It also has an educational farm and garden with an overlook on the lagoon, a good place to see flamingos from March through September. It can be visited on a guided tour. Also on the island are several short walking paths and the Devil's Bridge, Ponte del Diavolo, with no side railings. Torcello is a short boat ride from the island of Burano on Vaporetto line 9 that runs between the two islands every half hour from 8:00 until 20:30. If you plan to visit both islands, it's best to buy an island transportation pass when you leave from Fondamente Nove. Visitors can eat lunch or stay in the upscale and historic Locanda Cipriani, a unique place to stay after the visitors have gone for the day. It was here in 1948 that Ernest Hemingway wrote part of his novel, Across the River and Through the Trees, and the hotel has hosted many other famous guests. Another place to stay is Bed and Breakfast Ca' Torcello. Osteria al Ponte del Diavolo (closed Mondays) serves lunches based on fresh, seasonal ingredients and has outdoor seating in a garden. Ristorante Villa '600 (closed Wednesdays) is housed in a building dating from the 1600's and has an outdoor dining area in a beautiful setting. Ristorante al Trono di Attila (closed Mondays except in summer) also serves lunch.